It’s been nearly three months since the launch of my new book, Marketing Above the Noise: Achieve Strategic Advantage with Marketing that Matters. During the last 90 days, I’ve been interviewed by press for print, online, podcasts and radio pieces that have appeared in a wide range of publications. I’ve presented to audiences from marketing students in New Orleans to seasoned consultants in Santa Cruz. And, I’ve spoken spoken to dozens of people about the key concepts in the book. There are a few key things I’ve learned through this process. We’re Being Heard Above the Noise! 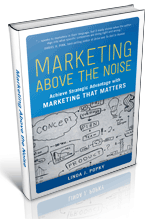 Linda’s new book, Marketing Above the Noise: Achieve Strategic Advantage with Marketing that Matters, is getting rave reviews. The media that have covered the book include Publishers Weekly, Library Journal, C-Suite Book Club, ChangeThis.com, 800CEO Reads Thinker in Residence, Connect, American Management Association Playbook, Dallas Morning News, BookIt, 33 Voices, Strictly Marketing Magazine, Executive Girlfriends Group, ChiefMarketer.com, BusinessTraveler.com, Sales & Marketing Management, Investor’s Business Daily, CMO.com, Sales & Service Essentials, Startup Nation and many more! Check out all the latest coverage, including blogs and podcasts, here. Before you hit the beach, make sure you are putting your best face forward for Fall. We’re offering a one-time special Be Heard! 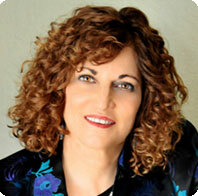 Marketing Makeover for small business owners, entrepreneurs, and consultants. 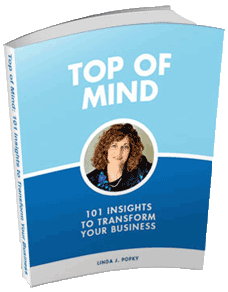 Award-winning marketer Linda Popky will review your current business presence, including website, blog, social media, speaker sheet and marketing collateral. She’ll make recommendations for quick action steps that you can take now to ensure you’ll be heard more clearly in the fall. 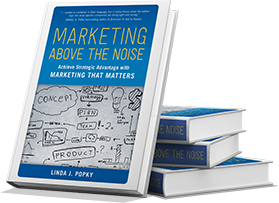 Includes 30 days ongoing access to Linda via phone and email and a signed copy of Linda’s new book, Marketing Above the Noise: Achieve Strategic Advantage with Marketing That Matters. 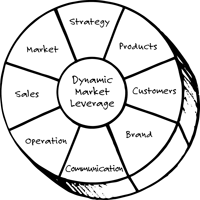 Listen to Marketing Above the Noise! Don’t have time to read Marketing Above the Noise? The audio version of the book is now available through Audible.com. Could You Use The Write Stuff? 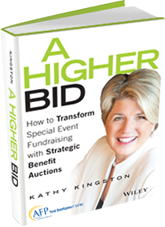 I’d like to congratulation benefit auction guru Kathy Kingston on the success of her newly released book, A Higher Bid, which I edited. The book has been a breakout success on Amazon. Let me help you take your book proposal, manuscript, white paper or other writing project to the next level. 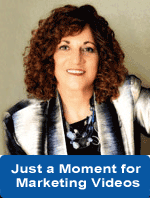 Linda’s recent presentations included Marketing for Consultants at Alan Weiss’s Million Dollar Consulting College® in Newport, RI and Be Heard at the Monterey Bay Consultants Group. Linda participated in the Silicon Valley Business Journal’s second annual Mentoring Monday, as well as the Women in Consulting Speed Mentoring Event, and the Invent Your Future Conference. She also presented about her new book, Marketing Above the Noise, to NorCal BMA, First Thursdays Silicon Valley, Business Networking Made Simple, the ExeConnect Networking Group, and in a special fireside chat co-hosted by Women in Consulting.